"My Favorite View of Hatteras"
At about the mid-point of the three hundred mile stretch of barrier islands that defines the eastern edge of the continent along the coast of North Carolina stands the Cape Hatteras Lighthouse. It is the tallest of the six active lights spaced between Currituck in the north and Bald Head Island in the south. Each of the lighthouses except for Currituck, which is unpainted brick, is painted in a different design, or daymark, for daytime recognition. The most familiar of the six is the bold black and white spiral pattern of the Hatteras light. The lighthouses at Hatteras, Bodie Island, and Currituck Beach were erected in that order between 1870 and 1875. As the workers finished one, they moved to the next site. All three towers are majestic brick structures of the same basic design. The Hatteras tower, 193 feet tall, is 30 feet higher than the others. Erected too close to the beach, Hatteras has been threatened by erosion from the beginning. Sometimes, during great storms, when the water reaches almost to the old tower's foundations, there is a real danger that the best know landmark on the east coast will fall. Perhaps it is the sense of peril that brings more visitors to Hatteras than to any of the other beacons. The majority of the visitor are drawn to the ocean side of the island for fishing, swimming and to see for themselves the threat posed by the encroaching Atlantic. Those visitors frequently miss the wonderful view from the Pamlico Sound side of the island. It is this vista that Dempsey Essick calls "My Favorite View of Hatteras." From this first viewing, the effect of the painting on the senses is immediate. The viewer is almost overwhelmed with the richness of detail. 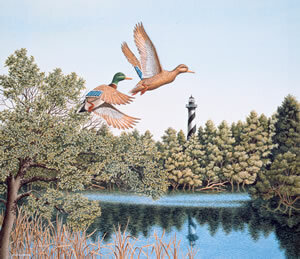 The Hatteras Light, visible over the top of the surrounding scrub, is a beacon for a pair of Mallards who have burst into flight after being startled from their nesting site at the edge of a small lake.